This intriguing book gives you the whole motley paranormal species, witches and werewolves are just a few that are mentioned. 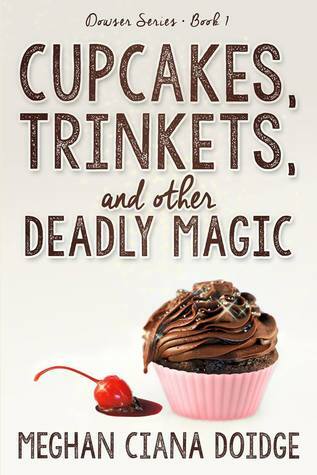 It also tells you of the very quirky main character, twenty three year old Jade Godfrey, a half witch, who likes nothing better than to bake sumptuous cupcakes in her shop "Cake in a Cup." One day her whole world gets turned upside down when a vampire shows his face at her shop doorway. He couldn't get in as wards had been placed so no one that was an "Adept," a magical being in other words, could come through without Jades permission. The sight of the vampire really rattled Jade as it was so unusual to see any vampires in her city of Vancouver. Although this certain vampire was good looking in a Scandinavian way with white blond hair, pale skin and icy looking eyes but he was scary with it. She could see his strong magic surrounding him. Then thankfully he disappeared. When finished for the day Jade had the surprise of her life when she walked in and saw the vampire perched on her little balcony. He told her that he needed to speak to her urgently as her magic had been found on a murdered werewolf and if she didn't he would go to the Conclave and request to be able to do a blood truth on her to get the answers he wanted. Jade did not know what he was on about. She wasn't a witch who did spells, she was a Douser, she could find objects which gave out the smallest residue of magic, which is what she did and with them she made them into trinkets. She had some adorning shop windows. There was nothing lethal about them. She told him so and he left telling her he would be back. Rattled, Jade got herself ready to go to the restaurant and disco that she had agreed to accompany her foster sister Sienna, who was a half-witch like herself and Sienna’s boyfriend Rusty, whose birthday it was. By the time Jade had got to the disco she was feeling much better and managed by dancing to give herself up to the magic that was coming from all the other Adept in the room. Magic was drawn to Jade; it filled her up, making her feel great and then she found herself being surrounded by three Adepts dancing around her. With strong magic coming off them, she realized then that they were werewolves. Then weaving himself through the other dancers she saw him. So good looking, muscled chest and dark short cropped hair and a dazzling smile. Jade felt his potent magic as he moved closer to her. He was gorgeous. He touched her hips as they danced. The wolves surrounded them but she was not afraid even though she should be. The magic increased as they danced. He introduced himself, his name was Hudson, and he wanted to see her back home. Even though she was very tempted, as her love life had been virtually non-existent for a long while, she had been brought up by her Gran, a very strong witch in her own right, not to mix magic’s and had to turn him down telling him that witches and wolves did not mix but he told her he would not give up. This is the very beginning of a very captivating story. You will find that Jades life will never be the same again and it makes a story you cannot put down. It has everything you could wish for going for it and Jade makes it come alive. The vampire makes it interesting as well. He is an unusual vampire with a minty tasting aura that drives Jade mad. 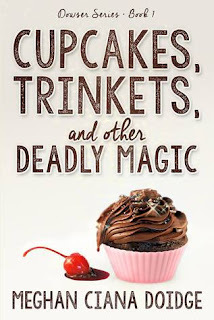 It is well worth the read and a great start to I bet a really great series. Love your writing Ms Doidge.